Villa Med 10 - Ballito Central Accommodation. Welcome to Ballito, the Dolphin Coast of KwaZulu Natal. The busy city vibe is overbearing your soul ... You need rest. Escape to the beautiful coastal town of Ballito for a memorable experience. Villa Med 10 is an upmarket, three bed-roomed, self catering unit in the heart of Ballito. Villa Med is situated on the inland side of Compensation Beach Road, a mere 10 minutes walk from either Willards or Thompson Bay swimming beaches, and within driving distance from Shaka's Rock and Salt Rock beaches. 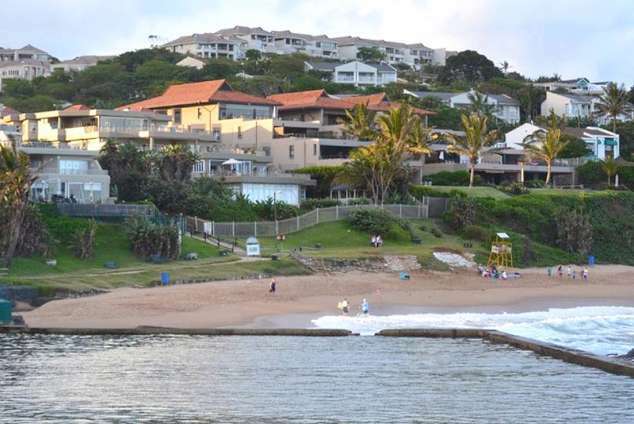 If it is a Natal North Coast experience you desire, Ballito should be your base and Villa Med 10 your home away from home from which to experience the beautiful weather, beaches and other attractions this region has to offer. Ballito is approximately 47 km away from Durban and a mere 21 km away from King Shaka International Airport. We welcome you to come and stay for a few days or weeks and appreciate the beauty and stillness that surrounds. Unit sleeps a maximum of 6 guests in one double bed and four single beds for which duvets and linen are provided. The living area, which opens onto a large patio, is comfortably furnished with a lounge and dining room suite and includes a TV, DSTV and DVD player. The fully equipped kitchen includes a stove, fridge with freezer compartment, washing machine, dishwasher and tumble drier, and microwave oven. A lock-up garage is included and uncovered parking for one other car is also available. Please bring your own beach towels. Access to the complex is by remote. Braai / barbecue - onsite. Kitchen (fully equipped) with tumble dryer and washing machine. Willards: Main beach - usually has entertainment in peak seasons. Thompsons: Has tidal pool and well known Hole-in-the-Wall. These beaches all have life savers. 478 page views since 30 Oct, 2018.